From left are HyeonOh Shin, Hyun-Tak Kim, and Tae-Hyuk Kwon. Shown on right explains the process of 3D carbon nanomaterials, using ultrasonic spray device. A team of researchers, affiliated with UNIST has introduced a novel manufacturing technology to form new materials, using ultrasonic waves used in medical diagnosis, humidifiers, as well as sonar systems for submarines. The method has received considerable attention as a new technique that is capable of manufacturing high-performance materials without the need of high temperatures or pressure. 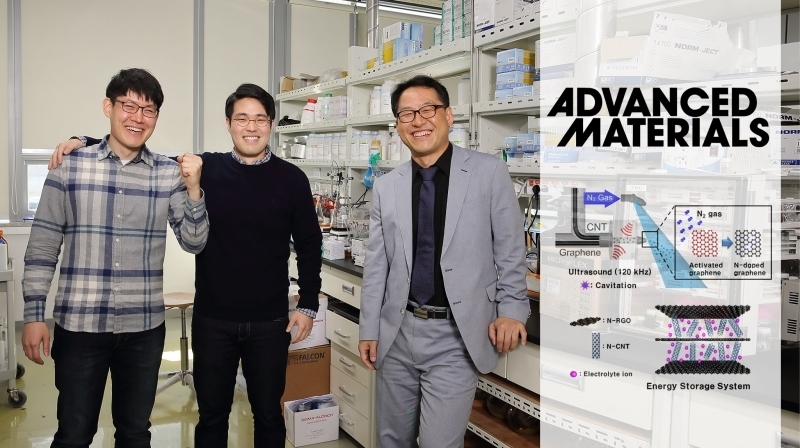 This breakthrough has been led by Professor Tae-Hyuk Kwon in the School of Natural Science in collaboration with Professor Jong-Beom Baek and Professor Noejung Park at UNIST. The findings of this study have been published online in the prestigious journal, Advanced Materials on December 14, 2017. In the study, the research team presented a new approach to form carbon–heteroatom bonds in carbon nanomaterials, inducing chemical reaction with inert N2 or O2 gases by ultrasonic spray deposition (USD). This new technique fixes nitrogen or oxygen into the carbon nanomaterials, using ultrasonic energy and ultrasonic atomization. It can be applied for many applications in materials science, including secondary battery materials, as it is capable of forming bonds between carbon and other atoms in a simple and fast manner. Their ultrasonic spray works according to the similar principle of a humidifier. Just as the humidifier breaks up the water into tiny droplets and spout a cool mist into the air, the carbon nanomaterial inks are ultrasonically atomized by the spray instrument to form fine droplets, which are nebulized by a compressed carrier gas (N2 or O2). Through this process, N2 or O2 is fixed into the carbon nanomaterials. The process of forming 3D electrodes, using ultrasonic spray. This study especially has attracted much attention for introducing an innovative approach that induces chemical reactions with inert N2 or O2 gases that virtually do not react chemically. The results show that all the carbon nanomaterials exhibit very high specific capacitances, high cycling stability, and structural flexibility after the ultrasonic doping process. In the study, the research team has also presented high-performance carbon-nanomaterial-based supercapacitor electrodes, using ultrasonic spray chemical reactions. Supercapacitors are capable of achieving a high energy density comparable to what Li-ion batteries can offer, but they have a much higher power density. It can be charged and discharged a virtually unlimited number of times without losing energy storage capability, which makes them ideal for aerospace/military applications that that require many rapid charge/discharge cycles. 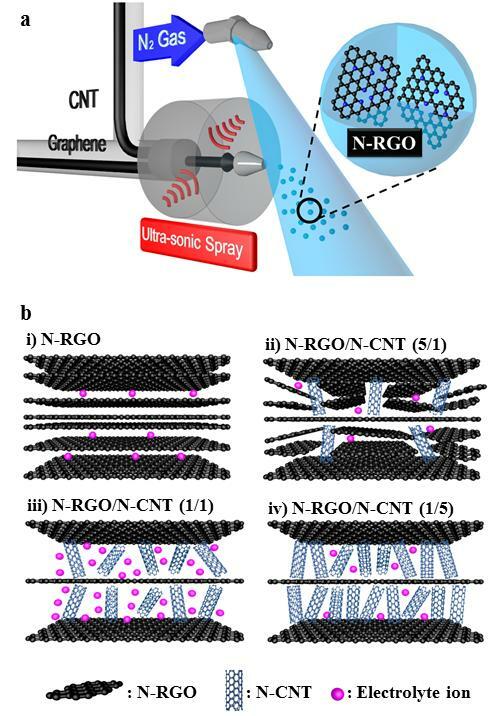 The research team used a double nozzle system of ultrasonic spray to fabricate the supercapacitor electrodes: N-doped reduced graphene oxides are introduced from one nozzle and N-doped carbon nanotubes from the other nozzle to realize 3D porous electrodes. This demonstrates that ultrasonic spray technology can be used to synthesize materials and produce a highly uniform film electrodes at the same time. This study has been also featured on the back cover of the December issue of Advanced Materials in recognition of its significance and innovation. Hyun-Tak Kim et al., “Carbon–Heteroatom Bond Formation by an Ultrasonic Chemical Reaction for Energy Storage Systems,” (2017), Advanced Materials.